I love changing up my nails for the season. While I do really love dark nails during the summer there is something about having the brightest nails possible that I love. These are the nail polish shades that I always go for, there is a good range of colours with a few different finishes and a nail polish for every price range. Swatched: Kryptonite, Daisy Know My Name?, Cream Soda, Kensington Passage, Get Set Go, Cancun & Supersonic. While a few of the shades make look slightly similar, I can confirm that all shades are different and I actually *need* all of these and more in my collection! 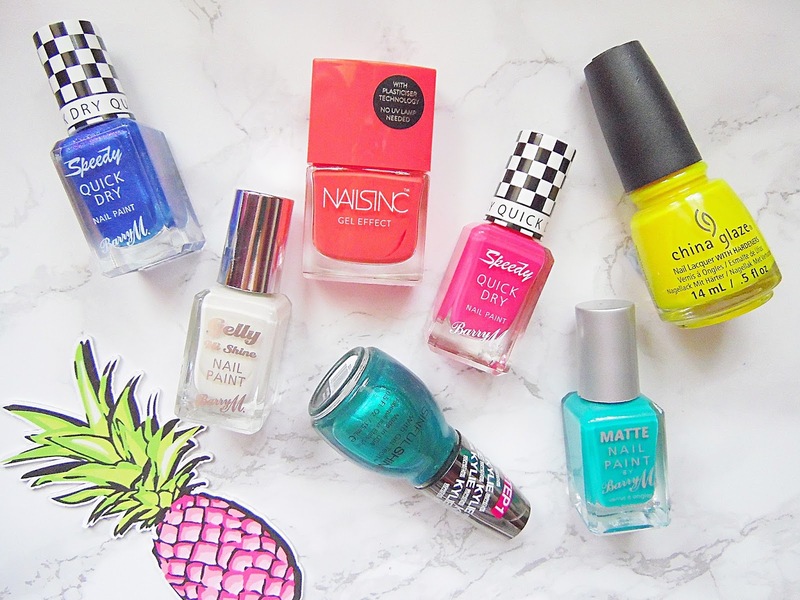 I love budget nail polishes and some of my all time favourite shades are from the high street but I do have a few more expensive shades but I still got them on a good deal! Depending on my mood will depend on the shade that I will go for, I have two shades that I always go for if I can't decide so I have included them as well. The brightest shade of them all is China Glaze's Daisy Know My Name?. I picked this up last year when I was going to Summertime Ball at Wembley Stadium and I love how this glows in the sun - it looks incredible! I would say that this shade needs three coats to avoid any streaks, or just two slightly thicker coats like I do! I have always liked China Glaze's formula but I do wish they would work on their brushes as they aren't as wide as I would like them to be. The newest shade I have added to my collection is the Sinful Colours Kylie Jenner shade in Kryptonite. These nail polishes are honestly some of the best ones I have ever found as they are so long lasting, without base and top coat I can get at least five days wear which is amazing for my nails. This shade is a stunning shimmer teal shade which reminds me of one of Kylie's famous wigs. My two shades which I go for if I just can't decide on a shade are Barry M's Coconut and Nails Inc's Kensington Passage. Coconut is a gorgeous off white which looks stunning with a tan and Kensington Passage is a coral/pink kind of shade, this shade looks lovely on the toes too. I have always loved white nails but finding a good formulated white nail polish is hard to come by but Barry M have this off white shade done perfectly as it isn't at all streaky. Kensington Passage was my go to shade last summer and I don't think it left my fingers or toes for months! My last three shades are all from Barry M - can you tell they are one of my favourite nail polish brands?! I have two shades from the Speedy Quick Dry range (my favourite line from the brand) and one from the Matte line. From the Speedy range I have Supersonic which is an incredible purple/blue shimmer, this shade looks amazing in the sun like the China Glaze polish. And Get Set Go which is a classic pink. The Speedy range as the name might suggest are very quick drying and are super glossy on the nails. The shade I have from the matte range is Cancun which is a turquoise, I am not actually a fan of the matte finish so I pop a glossy clear nail polish over the top and I am good to go! 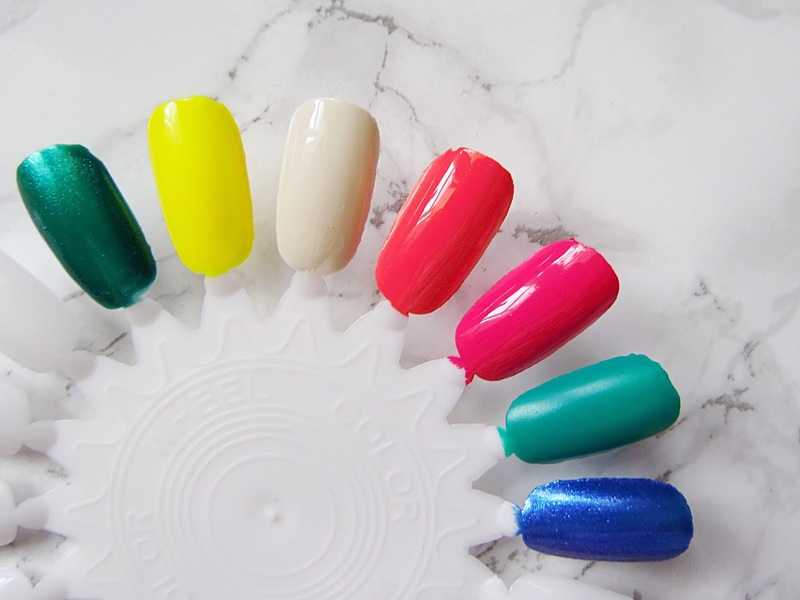 What are your go to summer nail polish shades?